It's every budding actor's dream - a starring role in a TV show or film that becomes a major hit. But then they try to move on - and find that their iconic character just won't let them. The latest actor to complain about being shackled to his famous alter ego is Alfonso Ribeiro. You may know him better as Will Smith's highfalutin cousin Carlton Banks from 1990s sitcom The Fresh Prince of Bel-Air. He's said being overshadowed by his character has "stopped me from being able to be an actor". The 45-year-old told Metro: "It has forced ME to be my character, hosting game shows and America's Funniest Videos. "I would like to try some stuff that is different from how the world sees me, just sink my teeth into… shoot, I could be a deranged killer! "But I doubt someone would automatically think of me when they go, 'We need to cast a killer, let's get the dude who played Carlton.'" He did also say the role was "rewarding in many ways" - and you could argue that an actor is lucky to get one part in a hit show in their career. Here are some other actors who have found it impossible to leave their most famous parts behind - and some who have managed to reinvent themselves. Perhaps the ultimate example of an actor known for one role, Hamill (above right) is and always will be Luke Skywalker. His non-Star Wars films remained relatively low-key so he went to Broadway, taking the title role in Amadeus in 1983. But when director Milos Forman made a big screen version, he is reported to have rejected Hamill, saying: "I don't want Luke Skywalker in this film." Hamill got around the typecasting by becoming a successful voice actor, including as The Joker in the Batman animated series. The force also remained strong for Hamill's co-star, whose performance as Princess Leia became iconic. Fisher had other roles - like in When Harry Met Sally and Hannah and Her Sisters - and wrote novels. But she said being most closely associated with Leia had been "great". "She's a very proactive character and gets the job done. So if you're going to get typecast as something, that might as well be it for me." Van Der Beek (second left) has struggled to shed the memory of teenage heart-throb Dawson, whose Creek was so admired by teen viewers from 1998-2003. "It did hold me back," he said in 2014, adding that movie directors would think he was too recognisable and not take him seriously. "But at the end of the day, it just makes you work that much harder." He has also parodied his own fame - even playing a bitter version of himself as an actor trying to revive his career in 2012 sitcom Don't Trust The B in Apartment 23. This could apply to any of the cast of Friends to be honest. In fact, Aniston has arguably done better than the rest - she's been in lots of middle-ranking rom-coms and got a Golden Globe nomination for 2014 drama Cake. But who are we kidding - she's still Rachel. "It's really hard to be cast in [a dramatic film like Cake]," she said in 2015. Especially if "you're someone who is battling a persona. Sometimes it's hard to disappear from it in a role." And sometimes it's hard to get away from a certain haircut. The star of the original four Superman movies in the 1970s and '80s, Reeve later battled to "escape the cape". He took a wide variety of roles on film, TV and stage before a riding accident left him paralysed in 1995. Only his later real-life role as a campaigner for spinal cord injury research came close to eclipsing that of the Man of Steel. 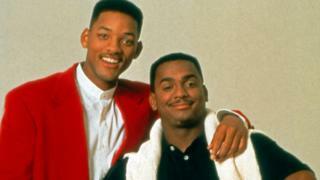 Starring in The Fresh Prince of Bel Air didn't seem to hold Will Smith back. In fact, it led to a string of hit films including Bad Boys, Independence Day, Men in Black and Ali, not to mention two Oscar nominations. And, presumably to Ribeiro's chagrin, he has even played a killer - as Deadshot in Suicide Squad. Perhaps he should be typecast a bit more. He can do comedy, action or drama - as long as he's an indomitable, smart-talking, high-energy hero. Films where he plays more sombre roles tend to tank. Having proved it possible to break out of the Star Wars universe, Harrison Ford isn't just the bloke who played Han Solo. Perhaps he was lucky in that he made two more major films - Raiders of the Lost Ark and Blade Runner - before The Return of the Jedi could trap him in that particular pigeonhole. Or perhaps there's another explanation - maybe he's a better actor than his Star Wars co-stars. Of the main Harry Potter cast, Emma Watson is probably the one where you think "oh it's that one from Harry Potter" least often. She's done a few half-decent grown-up films and we'll see how her biggest post-Potter movie, Beauty and the Beast, performs next week. But more than that - she's positioned herself as a serious social commentator. Daniel Radcliffe, too, is desperately trying to be a proper actor. But, perhaps because he played Harry himself, it might take a bit longer for us to shake off the image of the kid with wand and glasses.